Chase and Ava are ready for their next adventures as Time Jumpers! 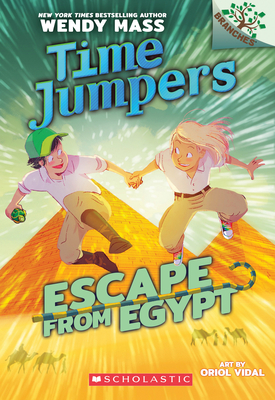 When Chase touches the dead, green-backed beetle in the suitcase, he and Ava spin through time -- to King Tut's tomb! Now they have to put the beetle back where it belongs. But the man with different color eyes is still chasing them... Why does he want these objects? Chase and Ava need to stay one step ahead of this bad guy. And they need to find some answers! Oriol Vidal's engaging illustrations appear on every page. Newly independent readers will eat up this time-travel series from New York Times bestselling author Wendy Mass.